Enjoy a comfortable evening read with the Niles Bookshelf Bed. This beauty combines hide-away headboard storage with under-bed full extension drawers. With its unique finish and sleek, clean lines, the Niles Bookshelf Bed will enhance any bedroom with the charm of solid wood. 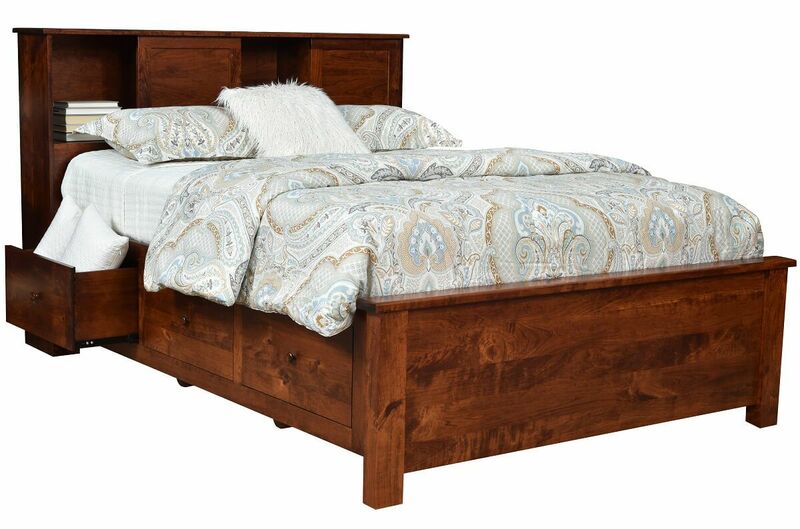 This platform base bed features six practical storage drawers which are finished both inside and out and are adorned with simple wooden knobs. Store additional bedtime essentials within the hide-away cabinets located in the headboard. Available in an array of hand-rubbed finishes and paint options, the Niles Bookshelf Bed is pictured in a Burnished Honey stain over Rustic Cherry. Rustic wood species will have more intensified natural characteristics including knots, mineral streaking, and color variations. Each made-to-order bed is truly one of a kind.